We often associate cows and herds of cattle with farming and ranching. These animals have a number of different uses and meanings across different cultures in the globe. Whether you are dreaming about cows, or wondering what the symbolism of a cow may be, there are a lot of different possible meanings. Today we'll look at the different dream symbol meanings, as well as what a cow can signify as a spirit animal or power animal. What Do Cows and Cattle Symbolize? Cows are often seen as a source which provide us with food to eat and milk to drink. For this reason, cows are very closely connected to how we feel about meeting our needs in the physical world. Many times, we associate cows with abundance and prosperity. In fact, during the times of the Great Depression, your family was considered to be rich if you owned a cow, because it could provide your family with a steady supply of milk. We often also hear the common phrase "cash cow" in business - which means that something is a steady and reliable source of income or profit. This saying comes because once you make the initial investment, the business owner will always have a steady supply to milk. A cow will often appear as a power animal or spirit animal for women who are struggling with fertility or are in need of support in their life fulfilling the roles of a mother. Mother cows and calves have a special bond, and so to dream of a cow or to have a cow coming as a symbol or spirit animal into your life could mean to embrace the maternal and nurturing aspects of yourself. Mother cows and their young calves reminds us that we are all connected to the divine source energy of creation. Cows are a reminder to practice kindness and caring towards all living things. While we may not immediately think of creativity and creation with cows, these animals are often here to remind us that we are all great creators in our lives. A cow can appear to give you some wisdom and support in creating the physical life you wish to live. 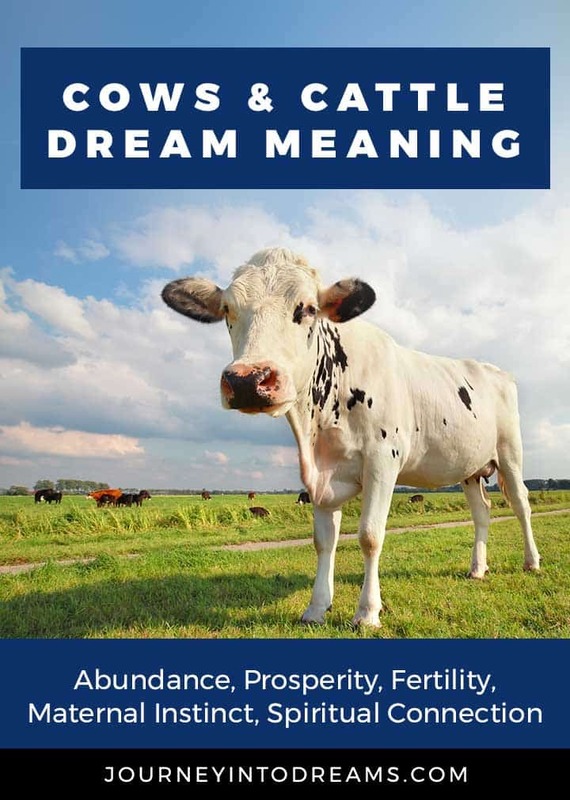 There are many common dreams about cows, and so if you are wondering what it might mean if you have a cow dream, these different scenarios and themes may be helpful for you to understand your dream better. What Is the Overall Mood and Tone of the Dream? If you dream of happy cows, this certainly means something very different than dreaming of sickly or sad looking cows. Dreaming of healthy and fat cattle grazing in a green pasture often means you are feeling content and peaceful about a situation in your life. You may feel as if your finances are well managed and that things in your life are going smoothly. If the cow or cattle look poorly fed, neglected or unhealthy, it is likely you feel as if you are not seeing the results from hard work and effort. You may not feel content with your current situation. You may feel as if your finances are suffering or are neglected. A stampede of cattle could mean that you are feeling out of control. You may feel unable to get a grip on your finances if this stampede in the dream is related in some way to profits or food. You may be feeling incapable of being able to provide for yourself or your family. In some cases, a stampede in a dream could also mean that a goal you are working towards will require a lot of effort and energy in order to see the results you wish to achieve. Milking a cow in a dream can mean that you are hoping to see success from your investments or work. This means you may feel confident about choices you have made, that they will yield the results you wish to achieve. Dreaming of a cow with young calves can often signify a desire to connect with your feminine and maternal side. You may feel as if you are in need of some care and nurturing, or there is something or someone in your life that needs nurtured. If you dream of happy calves with their mothers, this could mean that you are looking for ways to increase your abundance in life, or it could mean that you are trying to conceive or thinking about having children in your own life. If you are dreaming of cows being separated from their calves, it could mean that you are feeling disconnected from someone you care about or someone who has cared for you in the past. Baby cows will often cry when separated from their mothers. This could also denote that you are feeling abandoned or neglected by someone who is not being loyal to you. If you dream of a dark or vicious looking cow or bull, this could mean that you are fearful of a person you deal with in business, or that you may have an negative person in your life who is threatening your peace and happiness. An angry cow is quite a powerful force, so if you dream of a mad cow or bull charging at you, this could mean that you feel as if you are being attacked by something or someone in your waking life. You may also have some repressed feelings about your current financial situation. Does it seem hopeless? Does your current financial situation threaten your happiness or health? Often times, these dreams are stemming from not feeling like you are able to provide a solution for your problems. If you had a dream about a cow, you may wish to look up the meaning of the other items in the dream. Here are some related symbols that may give you additional insight into what the dream might mean. Storm Dream Meaning - Cows often handle storms with grace and calmness. Learn what storms may symbolize in a dream. Garden Dream Meaning - Did the cow appear in the garden in a dream? Gate Dream Meaning - Gates can often have interesting meanings in dreams, and could have some significance about opportunities and protection in your life. Arena Dream Meaning - If you dream of a bull fight or seeing a cow or bull in an arena, the meaning of an arena as a dream symbol can provide a lot more insight for you. Eating Food Dreams: If you dreamt of eating beef or milk from a cow, you may wish to look into the meaning of foods in dreams. Sometimes cows can appear in our dreams on a farm, along with other farm animals. Here's some common animals that may appear along with cows. Dream About Something Else? Check out our free online dream dictionary to look up dream symbols and meanings for thousands of different dreams. Did you have a dream about a cow? What do you think it means? Share your experiences in the comments below.